In a previous blog post, I extolled on how it takes a team of specialists to do a true restoration of a classic car. By the way, do not call a 57 Chevy a “classic” car. It is an old and great car with a large following. “A “classic” car is a “fine” or “distinctive” automobile, either American or foreign built, produced between 1915 and 1948 as defined by the Classic Car Club of America”. Don’t get too excited over that definition as it is strictly in the mind of the beholder. In this case, my mind. My 1940 Lincoln Continental is classic. My 1955 Chrysler C300 is a very special old car that goes like hell, but it is not a “classic”. I know that you are grateful for me giving you that insight. But I digress. I want to discuss the concept of a team as it relates to writing and publishing a book. I think that each of you out there might have a killer of an idea for a book that is locked safely in your cerebral cortex. By and large, for most of us, it should remain there. But in my case, it accidentally escaped, and the result is the Bootlegger ’40 Ford. I say accidentally because I did not intend to write a book. I just wanted to learn how to type and use word processing. “The quick brown fox jumped over the lazy dog” is the traditional way of learning how to type without looking at the key board as it supposedly contains all the letters in the alphabet. (Check it out and let me know.) I gave up trying and look at the keyboard when I type thus I type at “idle” speed and not “full race” like one of my former office managers. So I now had six short stories that connected with each other and had as the main character a 1940 Ford Standard coupe, my first car. Let’s say I had a rolling chassis; now I had to figure out how to put a body on it. I let a few people that I knew to be nonviolent read them and they liked them. I was put in touch with Judith Briles who bills herself as a “Book Shepherd.” She recognized me to be a sheep in need of pasture and maximum guidance. Thus the journey started towards publication of a book whose title was to be: “The Five Hundred Dollar Ford,” the strange odyssey of an old car. 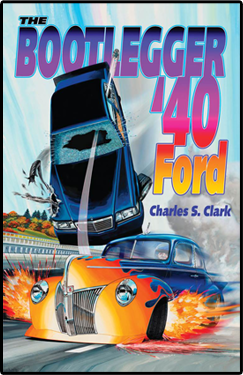 I got corralled into her focus group of writers and they came up with the current title: The Bootlegger ’40 Ford. Now as you sit at your desk reading this, think about what you need to know and do to take a manuscript stored on your disk to a book you hold in your hand. Don’t know, do you? Neither did I, but I learned and in the process spent some money and met some great people and learned one hell of a lot. Here‘s what you need to know if you get the itch to publish. The starting point is a story with heart. If you don’t love the story you’re writing, you won’t be able to stand it when you have to read it for the hundredth time. You have to make sure your brain is fully engaged in sharing something you care about. This is one of the reasons they say “write what you know.” I have the grease under the finger nails and scars on my hand that certify that I know old Fords. Once you’ve got a rough draft on paper, you need an editor. The editor is like the guy in the car club that knows more about old Fords than Henry himself. He can spot improper fasteners and mismatched parts so you can make the car correct. The editor asks those pesky questions you asked yourself as you were falling asleep, but decided to dismiss. “What’s my character’s actual motive for running illegal whiskey?” “Did I remember to introduce his very basic education earlier in the story so there is a frame of reference?” “What trauma happened in his family that makes him a law breaker?” You get much needed suggestions to improve small things like phrasing and big things like plot lines. This is a rather arduous process done by someone smarter than you. Next you need a proofreader. You used spell check and know your spelling is OK, but maybe not your grammar and punctuation, is not perfect. What? I got that city in the wrong state? And so it goes. You get the typo corrections that you badly need. Okay, now you’ve got a functioning automobile that’ll burn rubber and stop on the proverbial dime. (I know, I know drum brake Fords don’t do that) Next you need to dress it up so all the work you’ve done will have the right style to catch the eye of your reader, and represent the heart of your story. You learn about the cover and the back jacket and all sorts of important aspects of book layout. You cannot do that as it requires special talent and knowledge that you do not have. So you retain a graphic designer and layout specialist and low and behold you get something that really looks professional and not just something knocked out on your printer using clip art. Think about a book cover and graphic design. Your handsome face is the first thing that a new acquaintance sees. It hopefully makes a good impression that leads to love and a lifelong friendship. A book cover is like that, if good it leads to a sale and money in your pocket. Now a book cover as done by a skilled artist tells a story in a picture. It does not need to be complicated or expensive. It just needs to create an inviting mental attraction. Easy to say – hard to do. The cover you see on my book plus all the internal illustrations were done by Darrell Mayabb a premier hot rod illustrator. Why use him when I could use a talented artist in Bulgaria for a fraction of the cost? Look closely at the cover. The Numeral 8 on the hood of the car is red. The guard rails are correct for the autobahn. Darrell knows the car and the intimate details of the vehicles in that era. My text in the book as it relates to the car and its engine is quite accurate and I wanted that accuracy in the illustrations. Who cares? I do. I hope that you as a reader appreciate that. So I have pretty pictures and an edited text. What do I do with it? Well this is what your tens of thousands of readers (in my dreams) are going to see so it better be right. Too late to say “Ooops.” So as a final check you give it to a special editor who does a “cold read.” She just reads it like a book buyer but with a very critical sharp eye. Good lord how on earth did we miss that? I will give you an example: I have my character drinking Lowenbrau beer in the Hofbrau House. That is like drinking Coors at the Budweiser brewery. Cold read is the final hurdle before it is time to start the presses. So you now have boxes of books in a warehouse just waiting for orders to be filled. You have jumped all the hurdles and are now at the finish line. Wrong! You have finished the easy task which is writing and publishing the book. The hard work is promoting it so it will sell. Ever see one of those nature videos where a diver records a school of small fish in a huge pack swirling about in the water? You are one of those fishes. To break out of the swarm you need to be clever and ambitious in the use of social media. Not one of my fun things to do. I made a living selling capital equipment to hospitals. One on one customer relationships is a long way from mass marketing and all the special techniques that entails. That is a whole other team effort that this novice needs to utilize. Wish me luck. So what is next? Got a new keyboard with illuminated keys. Can’t type any better but it feels nice and looks pretty. What to do? I guess write another book only this time I am actually doing it on purpose. It is said that the way you learn to write is to write. Fortunately I have made the acquaintance of Mara Purl who is a successful professional novel writer among other talents which include acting and audio productions. Mara was able to penetrate my engineering oriented mind. Sticking with that “write what you know” advice, she suggested I write about the mind of an engineer. Turns out, it was a blast. We created a character who loves to figure out the inner workings of a car, and to solve a critical problem, he creates an ingenious car-part. We figured my books would be about cars; why not add short-stories about car parts? Thus was born The Titanium Camshaft, released as a short-story to ride along with The Bootlegger ’40 Ford. With some help, I wrote an engrossing story, had a great cover designed to coordinate with the Bootlegger cover, and suddenly, I was an author with TWO pieces of work for sale. See the stark difference? Oh damn I just noticed I got the Before and After mixed up. Oh well Mara will figure it out for me and get it right. I will stick to gears and grease when I write my next novel The Gunrunner ‘55 Chrysler. This entry was published in Bootlegger Book Blog.